Savory garlic mashed potatoes on a pizza crust. What a great idea! Spray counter lightly with non-stick cooking spray. Combine rolls and flatten into a 13-inch circle. Place on a 12-inch sprayed pizza pan. Brush dough with olive oil and allow to rest while preparing potatoes. Clean cube and boil potatoes until they are tender. Drain potatoes and add minced garlic, butter and sour cream. Mash together adding salt and pepper to taste. Spread potatoes evenly over pizza dough. 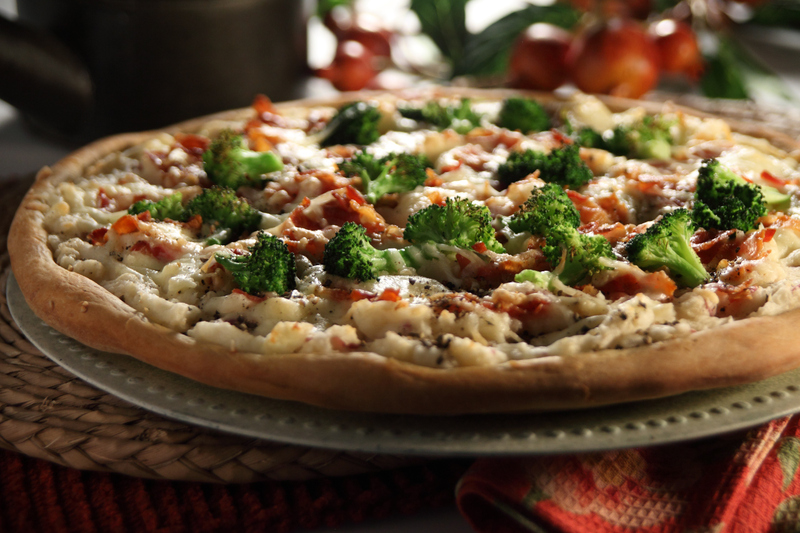 Top with bacon, cheese and broccoli. Bake at 375 degrees F 15-20 minutes.